Each diving group is kept small and according to the certification and experience level. A dive guide ensures your safety at all times and shows you the hidden gems of the Andamansea. Boat and dive site briefings are given during your day trip. Unlike others, we store, wash and transfer your privately owned equipment. Just jump on board and relax. Photos of the boat get published soon. The coziest dive boat Phuket’s brings you in a relaxed atmosphere to carefully selected dive sites. The M/V Matchanu is since March 2019 fully owned and operated by Aloha Diving.She is in April 2019 undergoing an extensive maintenance which includes a complete rebuild of the Diesel engine. We offer from May 2019 on M/V Matchanu day trips for scuba diving. The charming dive boat offers a very relaxed atmosphere. With only max. 15 divers plus instructors/guides, you experience a great mood among passionate divers. The spacious dive deck ensures every diver enough space to comfortably set up the diving equipment. The dive time is unlimited, meaning we stay in the water until we reach 50 bar (in Phuket dives are usually limited to 50 minutes). The boat always picks up the divers where they surface. This allows us to do varied dives and to enjoy drift dives. In addition the M/V Matchanu tows a tender boat for additional safety and beach visits. Refurbished 2018, 16m long, up to 15 divers puls dive staff, saloon, large shaded upper deck, spacious dive deck with freshwater shower and bathroom. Nitrox is available by pre-booking only and on a surcharge (see price list). On board are scuba cylinders both with DIN and Yoke fittings as well as emergency oxygen. With MV Domino we offer private speedboat snorkeling and scuba diving trips. Short cruising times: – Maximum cruising time is 60 minutes. Most dive boats need more than 2 hours to travel the same distance. Dive at the best spots: – Speedboat can get to shallow coral lagoons – snorkeling and beautiful sceneries. Small groups: – Maximum of 6 divers on board – personal care and small diving groups. The 13m Fibreglass Speedboat with 2x 250HP Honda engines is silent, comfortable and stable. A luxury layout for 15 guests (originally licensed for 25 people) allows maximum personal space. We offer with MV Dorado spacial dive trips and private Liveaboard cruises. With a maximum capacity of 19 divers, this is not only an ideal boat for parties and group celebrations. We can cater for weddings, birthdays or just groups of friends wanting to spend time together. This boat is the perfect choice for diving clubs (15 divers plus 4 dive staff) and group travelers focus on scuba diving. Nitrox is available by pre-booking only and on a surcharge (see price list). On board are scuba cylinders both with DIN and Yoke fittings and two air compressors available. With MV Dido we offer private snorkeling and scuba diving trips. MV Dido is a 12 meter Thai motor boat (built in 2007) and was modified and modernised in October 2015. The ship is equipped with a marine ISUZU 6-cylinder 200 hp diesel engine, and it is the ideal boat for groups up to 10 people. The upper deck with sun sail invites you to relax. Enjoy cold drinks and good food in the large salon with a integrated galley. The MV Dido has a spacious diving deck with platform and 3 fresh water showers as well as a marine toilet. Nitrox is available by pre-booking only and on a surcharge (see price list). On board are scuba cylinders both with DIN and Yoke fittings and an air compressor available. 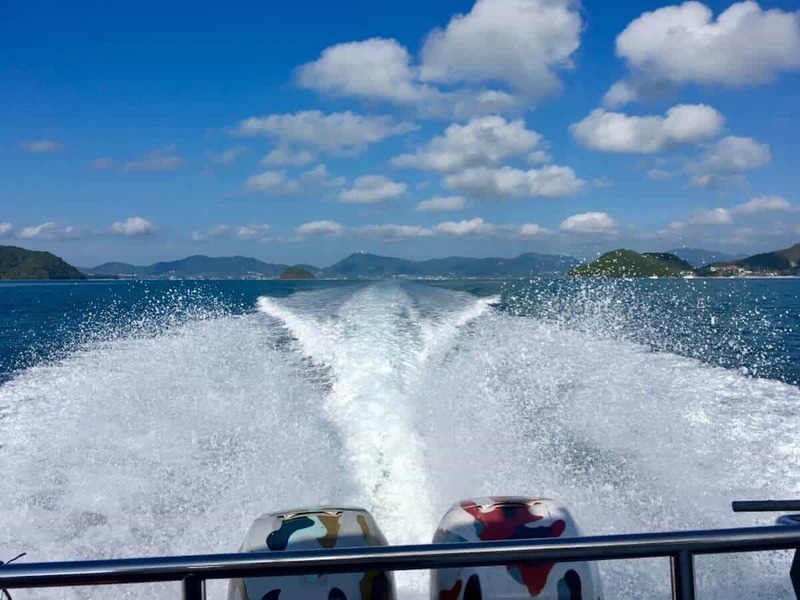 In Phuket large boats are used that are fully self contained with all the facilities you will need as a diver, snorkeler or just a fun day-tripper!!. All boats have both outdoor rest areas, sun decks, indoor saloons, sea toilets, meals areas and fully equipped dive decks. Air fills are always provided between dives allowing for a schedule of at least 3 dives per trip – weather permitting. To get to our famous dive sites, trips of 2 to 3 hours may be needed across the open sea. So we encourage you to accept our recommendations to use the most seaworthy boats with the best safety records and the most experienced skippers and crew in Thailand. We work closely with a number of highly reliable boat operators giving us the flexibility to conduct dive trips according to your specific needs.Nitrox is available by pre-booking only and on a surcharge (see price list). On board are scuba cylinders both with DIN and Yoke fittings, 2 air/nitrox compressors available. MV Kepsub is Thai owned and operated. We offer with that shared day trip boat dive trips with 3 dives. Refurbished 2014, 30m long, up to 35 divers puls dive staff, indoor saloon/dining area, outdoor shaded area, large sundeck, spacious dive deck with freshwater showers, 3 bathrooms, Galley. North Star is Russian owned and reaches farer dive sites then other diving boats. We offer with that shared day trip boat dive trips with 3 dives. Built 2013, 35m long, up to 50 divers plus dive staff, indoor saloon/dining area, fully equipped and air conditioned classroom, outdoor shaded area, sundeck, spacious dive deck with freshwater showers, bathrooms and Galley.